1. Goodmans catalogue of 1914. The catalogue didn't state the rootstock used, which is unfortunate. Today loquats are normally grafted on quince rootstocks which produces a fully grown tree about 1/4 the size of a seedling loquat or a loquat grafted onto a seedling loquat. If the tree is of a considerable age but has failed to reach the great size many attain then it can be assumed that it is on a quince rootstock and therefore must be grafted. From this it can be assumed that it was once a named variety, even if its name has been long lost. 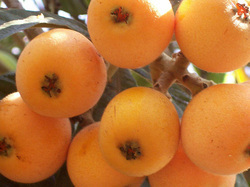 The prices quoted for loquats suggest that the trees on offer may have even been ungrafted seedlings. The catalogue used American spelling for words such as color (colour) and flavor (flavour) and this has been retained. Loquats grafted on quince stocks take from 6-7 years to start bearing, Loquats grafted onto seedling loquats take longer, even up to twenty years in some instances. It is asked that anyone intending to use this information in commercially published form ask the permission of Neil Barraclough, RMB 1477, Stratford 3862.